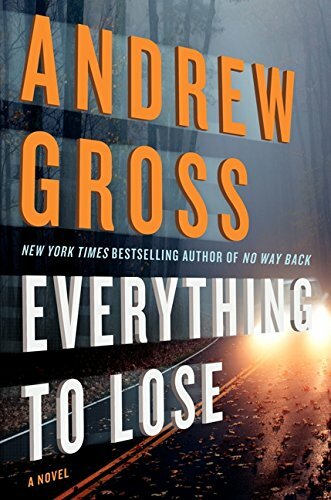 In Everything to Lose, Andrew Gross presents several knotty problems that he neatly ties up at the end to make one complete suspense thriller. The story opens with a prologue introducing a situation—one that occurs twenty years prior to the rest of the story—between a man and a woman and love under a bridge—that goes terribly wrong. The players in this scene are unnamed. The situation that actually starts the story, however, is an automobile accident on a quiet highway in the dark of night. Hillary Cantor witnesses the accident when a car veers to miss a deer and careens off the road into a deep ravine. When she races down the hill to determine if she can help the victim, she discovers a dead driver and a cache of $500,000 in a satchel. Hillary’s own life is in a tailspin. Her ex-husband is making excuses as to why he is unable to pay for child support and house payments while he and his new family take jaunts to exclusive vacation spots; her son’s special needs school expenses are unpaid; and she has just lost her job. The idea of taking a half million dollars from a dead man has terrific implications toward resolving her problems. Of course, there is the other side of that coin: Who is the dead man and is this money legally or illegally obtained? And further: If she does abscond with the money, how would she handle it and who might come looking for it? That last question propels the story forward. Before a second witness appears, she hurls the satchel into the woods, deciding to return at a later date and collect it. She departs the scene before the police arrive, leaving only her middle name with the second witness. Author Gross makes it clear that indeed there is something amiss about this satchel full of money, and he introduces several murky characters who begin the search for the missing trove. Hillary is confident that she can never be traced. She learns more about the dead man, and confusion sets in as she finds him to be a pillar of the community, but not a wealthy man. Everything begins to go bad when she learns that the second witness to the automobile accident is found dead, supposedly a suicide victim. Worse yet, she returns home one day to find her house has been ransacked. At this point, she realizes that she is out of her league and makes a decision to bring Patrick Kelty, the son of the man killed in the automobile accident, and a New York Police officer, into the picture. She believes that Patrick may have a vested interest in learning more about where his father acquired such a large amount of money. As the story moves forward, Gross takes the reader to several unrelated places—back to the original prologue situation: a murder that occurred several decades earlier under a bridge, to a high-profile meeting between politicians, even to Ukranian mob activities. Each new mini-situation leaves the reader wondering how they will conflate as the story progresses. And yet the relationships become clear under Gross’s deft handling of the story. By the time the reader arrives at the last page, everything is made clear. The ending is semi-happy but completely acceptable by all standards of suspense writing. Yet as with many good things, there is a flaw—and yet only for the purist writer. Gross did not pick a smooth point of view through which to tell his story. His point of view moves from one character—first person—to another character—third person—to yet another character—first person, and continues this back-and-forth process throughout the entire story. It is, at times, difficult to follow who is narrating a given chapter of the story and equally difficult for the reader to establish a relationship with a character. Presumably, Gross realized this since he put some of the first person characterization in italics and other parts in straight roman type. The story would have a better flow were it told entirely in third person, and yet the plot itself is strong and plausible. Andrew Gross is a skilled storyteller, and he drives the tension to its climatic point, pulling the reader along. It’s a difficult book to put down as the drama unfolds.